Amazon lists the retail price of the Charge at $169.95. 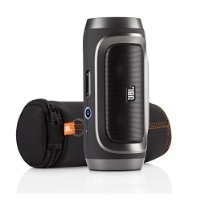 That's a little ambitious: JBL says the Charge is $150, so Amazon's discount to $89.99 isn't quite as dramatic as the listing would have you believe. Also, the $90 special price is only available for the black, blue, and green models, with the two-tone grey model strangely marked up to a full $100. As with all Gold Box deals, the speaker is eligible for free two-day shipping to Amazon Prime subscribers. The Charge uses two 5-watt amplifiers, two 1.625-inch drivers, and a bass port for some extra oomph compared to similarly small speakers. Its omni-directional design allows for room-filling sound, and the 6000mAh battery can play music via a standard line-in or Bluetooth while giving your phone a boost at the same time. The JBL Charge has since been upstaged by the slightly larger Charge 2, $150 (with the same battery), and the JBL Pulse, which foregoes the gadget charging ability for a fancy LED light show, $200.